Hi friends, I'm so glad you stopped by! Today I will show you how to tweak a bench by replacing the fabric. I purchased this dreamy white bench a while back before I started blogging. It wasn't so dreamy when I purchased it. It was brown and the upholstery was dark and dirty. Sorry, there are no before pictures of it in its dreary state. Below is a picture of the first big change to this bench. I painted it white and covered it with a yellow and red floral print. I thought it would look pretty in front of the window in my daughter's bedroom. Once I placed it there I realized it needed a tweak. I replaced the floral print with white burlap. I didn't have to measure. This extra piece was the perfect fit. I used a staple gun to attach the burlap. Then I replaced the seat back on the bench. I gave the bench personality by hanging a heart banner to the back. If you would like to know how I made the banner just click on the link. That's all it took for this simple tweak. I love this sunny spot in her bedroom! It is a cozy spot for flute practice. Your dreamy white bench looks much prettier (and dreamy) with the white fabric. What a pretty music room! Very pretty bench - love the heart garland also! All white does give everything a dreamy quality. The room looks so cozy and serene. I am afraid of all white though, like some people are afraid of color!! My house is all color. Love everything about this….so pretty!!! Thank you for sharing at One More Time Events. 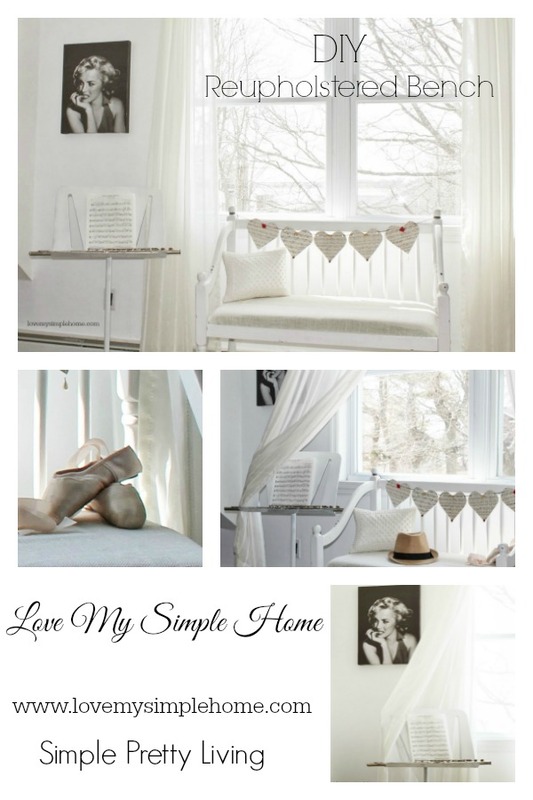 What a beautiful room and I love the bench with the white burlap! That bench is just adorable! I adore the contrast between the burlap and the sheers -- very dreamy! How pretty, your bench looks amazing! it looks beautiful - and that heart banner looks so pretty on it! What a dreamy spot! I love the new linen on your bench, and that Marilyn photo. Thanks for sharing at Fridays Unfolded! The white burlap really made it look elegant. Love it! Sweet spot for your daughter to hang out! Thanks for sharing it with SYC. Stopping by from Make it pretty Monday! So Dreamy! Love this bench! Drop dead gorgeous. Really love the banner....nice touch. I saw this on the Sunday Best Showcase. Beautiful bench, love the burlap and white! I nominated your sweet blog for the Liebster Award! You can find out more info at thequeenandhercourt (dot) com!